This project status is still Critical (I.E. Red). For AD this effort remains on hold until the non-technical aspects of the project have been resolved. For META, the team is planning the production migration of the web-service to prevent creation of further conflicting user accounts. The team has completed definition of requirements for a web-service to prevent creation of duplicate accounts. Sign-off for these requirements is being gathered. The team has been reviewing the results of a process to compare conflicting user accounts. Updates to the comparison process have been identified, and implemented. The team is continuing to review those results. Additionally, the team continues to work on requirements for data attribute syncing, and management. The first meeting of the Technology Advisory Committee was held on 02/13/13 and the first meeting of the TAC Hardware Advisory sub-committee (TAC HW) was held on 03/14/13. The TAC HW meeting was attended by Rick Beattie, Dan Burgardt, Rose Galindo, Phil Hauptman, Joe Heppert, Chris Howe, Jamie King, Ephrom Marks, Jaci Matney, Amber McCullough, Easan Selvan and Karla Wallace. This group will be working on hardware standards for network equipment on campus (e.g. desktops, laptops, printers, fax machines, servers, etc.). Focus groups will be scheduled with select faculty on campus to obtain input from them regarding the types of non-cluster research machines that are in demand among researchers, and to gain their buy-in and support for this standardization effort. The project team is investigating the use of Kivuto for software distribution at KU Lawrence as it's already in use at KU Medical Center. The project team continues to perform analysis on multiple years of software purchase data, with a focus on overlaps between KU-L and KU-M, looking at total spend with each individual vendor. Total savings recognized to-date is $297,174.54. The workgroup continues to monitor new processes, collect cost savings data and promote MFD usage across campus. The Server Centralization team continues to work to implement server hosting plans and managed services hosting agreements for departments. Migration and planning meetings have occurred with Kansas Unions and Art & Design. An additional 3 server systems were decommissioned or virtualized. A total of 105 servers have completed transition to date. Planning meetings have been scheduled with Architecture & Urban Design. Social Welfare IT assessment has been completed. The Director of Support Services is drafting the centralization proposal for their area. The Edwards Campus IT assessment has also been completed. Senior KU IT staff are scheduled to meet on March 21 to discuss their centralization model. Finally, the team met with Dean Wazel from the School of Music on March 14 and agreed to start the IT assessment of their area. The network teams continue to move forward on the Changing for Excellence Network Optimization initiatives. Network engineering continues to improve on the KU Peering Network design. The DNS stakeholders are finalizing a design. 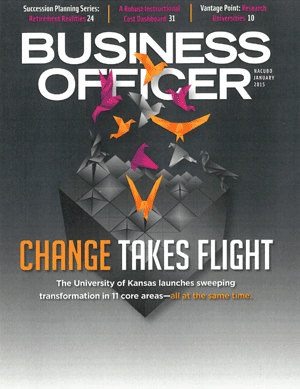 Progress continues to be made on changing overlapping IP addresses at the KU Lawrence and KU Medical Center campuses. The Invoice Processing team released the new workflow to production with the second wave of the KU Procure-to-Pay Initiative on March 11, 2013, completing Phase One of the Enterprise-wide Document Imaging and Workflow project. Phase Two will be highlighted in the next update. This is the final status report for Student Services CRM as that project is being closed. Beginning next week status will be reported on One-Stop-Shop Portal as it will be the entry point for CRM functionality for students. The Graduate Studies CRM project meetings are being held biweekly with IT and CollegeNET staff. The project team and School of Engineering began testing campaign functionality and successfully tested one campaign communication plan cycle. Discussions are underway with Edwards Campus and School of Business staff regarding email templates and communication plan setup. The goal is to have most functionality available and in production by the end of March 2013. Phase 3 : Early adopter user enhancements have been gathered, and a baseline for project requirements has been established. Implementation of the user requested enhancements have begun. Biweekly meetings have been scheduled to review feature rollouts. Faculty PRO phase 1 integration requirements have been baselined. Development of these requirements will begin immediately. The spring pilot of Early Warning began on 01/22/13. Eight courses are participating in the pilot. The first progress survey was sent to faculty participating in the pilot on 03/01/13. As a result, 105 tracking items were raised, the vast majority of which were Kudos sent to students performing well in their courses. Work is under way to test a system that will enable the various schools and departments to load advisor assignment information into the system for all undergraduate students. Financial Aid & Scholarship are preparing to participate using the calendar in their back office beginning in April 2013.